Clayton Graham is the President of Sundance Landscape & Maintenance, Inc. Sundance Landscape Maintenance is a full service local family owned and operated HOA Landscape Maintenance Company that has been serving the valley for three decades. Clayton holds many certifications including: certified arborist, Smartscapes, Sustainable Landscape Management (SLM), Arizon Certified Landscape Professional (ACLP), and Arizona PMD. 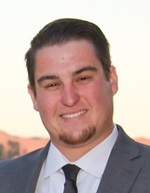 Clayton currently serves as ALCA's Vice-President.